Direct procurement spend is one of the major spend area for certain industry segments like automotive, manufacturing, defense etc. Companies which belong to these industries are looking out for unified solution that covers all spend including Direct, Indirect and Services Spend. Direct Spend is one of the major item and P&L of companies. 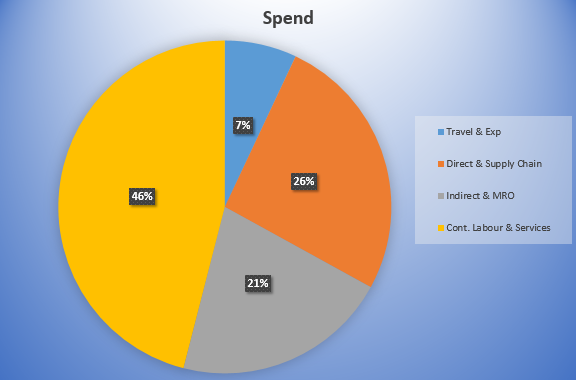 Below spends matrix is indicative spend but shows that Direct spend of 26% also a significant chunk that needs to be brought under overall spend control. SAP as product vendor for Ariba solutions understood this need and started to incorporate the missing pieces of direct procurement. 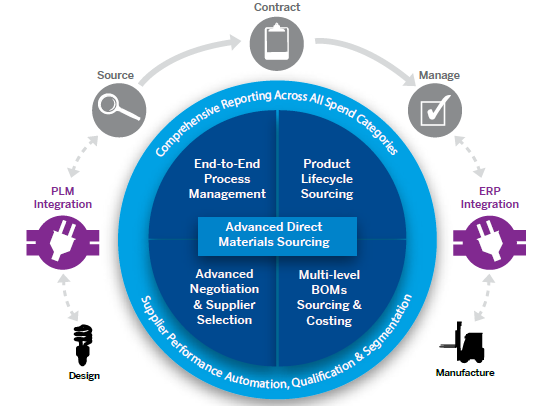 This addresses the Direct Sourcing needs via integration between PLM and SAP Ariba Sourcing. 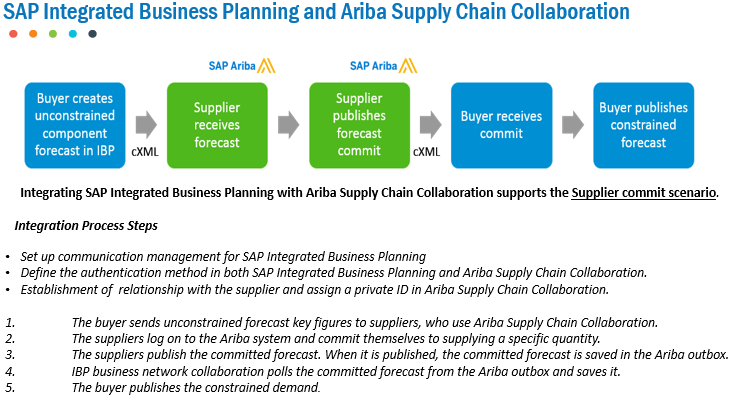 Further it addresses the planning collaboration by integration between SAP IBP and Ariba Network to provide visibility of the forecast to the supplier. Supply Chain Collaboration (SCC) on the other hand provides the visibility of Subcontracting process from issue of raw material to manufacturing status of goods and receipt of finished good. SAP added the direct sourcing function wherein the PLM/ERP system can be integrated with Ariba sourcing to receive the requirements from exploded BOM. All such requirements will then be sourced by using Ariba sourcing and rest of the procurement process will be followed in Ariba or SAP back end. ERP planning systems getting integrated to ASN to get the commit from Supplier over planning forecast to confirm future receipt else on uncommitted demand, planner can take advance action to avoid supply disruptions. I would like to categorize- Two Main Area for Direct procurement/planning in SAP Ariba by integrating with ERPs. Direct material Sourcing: leveraging existing Ariba Sourcing application with Quote to RFX Functionality. (Integration -ERPs<> Ariba Sourcing) and Product Sourcing with BOMs and Quote Automation. Supply Chain Collaboration (SCC): Extending procurement for demands/Forecast of Direct Materials. (Integration –ERP Planning system/IBP <> ASN) to get timely Forecast commitment from vendors on ASN so the planning can be realistic as per business requirement and indications to planner for any glitches in Supply chain to take alternative action in time to avoid supply disruptions. Let’s see in detail on these two main areas and how they fulfill the direct spend requirements. SAP Ariba is continuously doing innovations for maximize utilization of B2B Network (ASN) Cloud to provide enhanced visibility and transparency across supply chain for direct materials for discrete and process manufacturing, Consumer Goods, Pharma / life sciences, retail businesses/industries etc. Ariba Collaborative Supply Chain is for faster and effective collaboration with suppliers and trading partners and not going to replace the existing infrastructure of IBP, APO or SAP ECC planning engine. Online and context specific Communication. collaboration among supply chain partners. Fig.4: Supply Chain Collaboration integrations for Direct Spend. SAP Ariba offers best in class direct material and supply chain collaboration tools for seamless connect between all systems and stakeholders to a common plan so they can better orchestrate multi-tier supply chains and reduce inventory. Supported scenarios include processes for subcontracting, consignment, forecasting, and supplier-managed inventory as well as returns. There are several steps in Contract manufacturing /subcontracting process to be followed as per best practices in procurement. Basic scenario which was supported in conventional ERP now can be integrated SAP Ariba ASN as basic ‘subcontracting purchase orders’ with components, ‘purchase order confirmation’, and ‘ship to’ notice of finished goods (ASN) to the buyer. The buyer sends a goods receipt and invoice to the supplier. In addition to basic subcontracting, process allows buyers/suppliers to monitor component shipments/deliveries. Component shipments are supported as well as visibility of component inventory and component acknowledgement. There are two different options for component shipments. One-step process: In this process both the ship notice request and product activity message are sent in a single step. The proof of delivery is triggered at the supplier side once the components are received. Two-step process: Overall steps are the same as the one-step process, the main difference is when these steps are taken. The two-step process waits for the product to be received before the product is moved into the buyer system, and a product activity message is triggered. Finished production: Suppliers on AN with SAP ERP have option to intimate buyer about production of the finished goods thru manufacturing execution system (MES) visibility. Messages are usually triggered from completed production orders in the supplier system and sent to inform the buyer of how much finished goods has been produced. Real-time consumption: Real-time consumption is when the supplier uses up the components originally shipped by the buyer and then notifies them. Once the buyer receives the notification, a product activity message is sent to the supplier from SAP with current component quantities as SAP needs to be the system of record. If real-time computation is not used, then the product activity message for component overview is sent when the goods receipts from the ship notice of finished goods is sent. SAP Ariba does not stop for only Subcontracting processes but has Multi-tier Subcontracting process which is reverse of Third Party Ordering or Drop Ship system in conventional ERP terminologies. 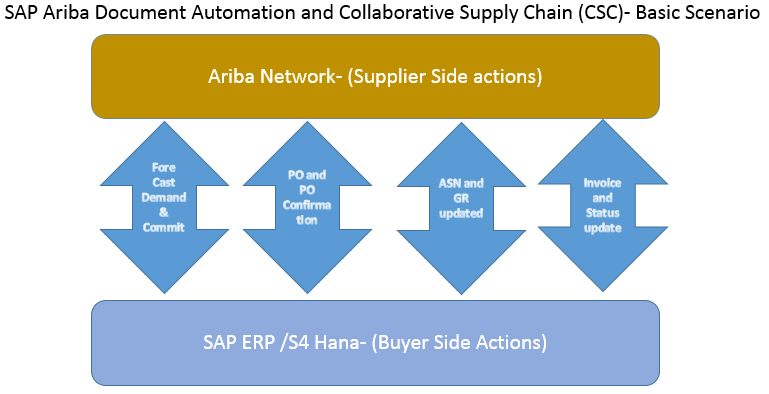 In addition to supporting straightforward subcontracting scenarios, SAP Ariba Supply Chain Collaboration for Buyers has been extended to allow for full visibility of goods movements between subcontract manufacturers and parts manufacturers via multi-tier purchase order and goods receipts. To provide full visibility to both the subcontracting manufacturer and the supplier providing materials to the subtracting manufacturer, the buyer creates two purchase orders in their ERP system. The first is sent to the subcontractor that will assemble the final product and to the supplier who will drop ship materials to the subcontractor. Once the subcontractor confirms that they can build the final product, the buyer will send a standard PO to the supplier providing one or more of the components required to build that product, who will also confirm they can deliver the components. Since the subcontractor and supplier don’t have visibility to each other’s systems, the supplier will send a component shipment notice to Ariba Network. A copy of that will be created on Ariba Network and made visible to the subcontractor via the component inventory tab (note that component inventory is not PO-specific, but purely overall quantity based). When that component inventory is actually received, a goods receipt is sent from Ariba Network to the buyer’s ERP system. Normally, a proof of delivery would be generated, but for multi-tier scenarios, the process will generate an outbound goods receipt to the original supplier in Ariba Network. Component inventory will be updated as per the standard product activity message sent to the subcontractor. Forecast collaboration provides several benefits to the supplier. First, by providing suppliers with near real-time visibility into demand forecast, it allows them to more effectively schedule operations and plan capacity usage in order to meet the buyer’s requirements. This also allows suppliers to provide commitment against the buyer-requested forecast quantities, which can then be mapped to processes in the buyer’s material requirements planning (MRP) software. Supplier managed inventory- The SMI model expects the buyers to have a Scheduling Agreement defined in SAP ERP to allow the suppliers to replenish. In many industries and regions, the suppliers need to plan and replenish based on their MRP requirements. In such a scenario, suppliers don’t rely on an order from the buyers. Instead, the supplier’s MRP system plans for fulfillment by automatically creating a Sales Order in their system based on the buyer’s demand. In addition to sending a long-term plan, supplier-managed inventory (SMI) functionality allows suppliers to manage the stock levels for a buyer and send the product based on scheduled agreements. This process allows suppliers to see the gross demand and current inventory levels and make any necessary adjustments based on capacity to satisfy the needs of buyers. It also allows suppliers to manage the day-to-day execution of the forecast plan and send back the SMI agreement schedule lines to buyers. They can then ship against those schedule lines and be measured to the original forecast commitment they agreed upon. 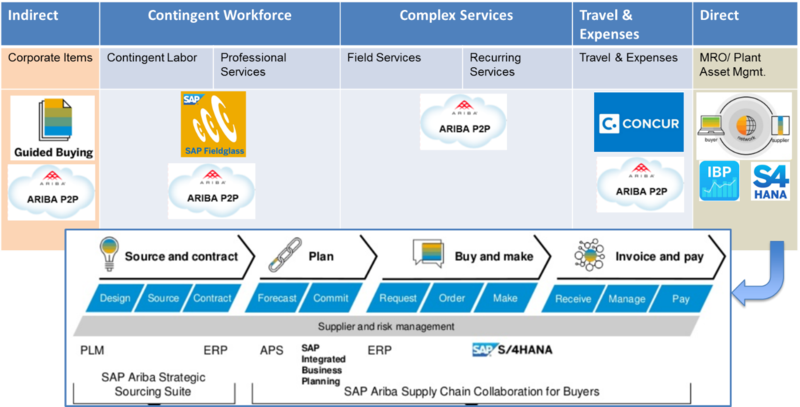 Fig.9: SAP ARIBA Supply Chain Collaboration for Buyers- Forecast and Supplier Managed Inventory. The nature of consignment inventory is that “change of ownership” is unrelated to the shipment/receipt processes. This is contrary to the basic design of most inventory/accounting systems’ transactional processes. Because of this, most inventory systems do not handle consignment inventory very well. This feature enables buyers to send consignment line items on POs to suppliers and receive consignment goods that are still owned by the suppliers. The feature provides visibility of the consignment PO items, visibility of the consignment material movements, transfer of ownership of stock, and invoice settlement based on the material movements. Consignment Movement: After the goods receipt is generated in SAP, the consignment movement using transaction MB1B triggers the product activity message to Ariba Network to transfer consignment stock to own stock. Consignment Settlement and Invoice: After the consignment to own stock is performed, a settlement is performed and an invoice is created and sent to the supplier. 2. Direct Material Sourcing with SAP Ariba. SAP Ariba Strategic Sourcing integration with SAP ERP or SAP S/4HANA is implemented when a customer wants to manage their operational procurement process within their SAP ERP or SAP S/4HANA separately from their strategic procurement process in SAP Ariba Sourcing. Manually created purchase requisitions in SAP ERP materials management (MM) that then create a request for quotation (RFQ). Automatically created purchase requisitions during MRP runs that then create an RFQ. Manual creation of SAP ERP RFQs without purchase requisitions. With ongoing innovations by SAP, now It is possible for creation of Sourcing Request from the Quotations in back end ERP system which trigger sourcing activities in SAP Ariba to create sourcing Projects on BOM and Materials. Users can now create complex templates as required for sourcing direct materials and make use of them in Product Sourcing. Previously, sourcing managers using the Product Sourcing dashboard tab were limited to using simple RFX events to get price quotes. As a result, buyers were unable to utilize functionality available in other event types, such as detailed RFPs and auctions. Buyers had the ability to create purchase info records (PIR), but were unable to create purchase orders and outline agreements from simple RFX events. This feature enables buyers to get quote pricing from bill of materials (BOMs) parts or from the list of materials they manage. Buyers can create any type of sourcing event they want directly from a BOM part or from the list of materials they manage. For example, a sourcing manager may want to run an RFP event or auction based on their list of materials. SAP Ariba does not restrict or limit the types of sourcing events which buyers can run. Buyers can also collect pricing for materials with a total quantity based on the BOM quantity or BOM volume, across all BOMs. When buyers create sourcing projects from Product Sourcing, SAP Ariba automatically transfers historic prices, quantity, supplier specific prices, and terms with supplier specific values to the sourcing project. SAP Ariba also automatically adds AML suppliers from product sourcing as invited suppliers in the sourcing project. Buyers can also search for additional materials in Product Sourcing and add those materials to their sourcing events. Buyers can accept pricing during the event award process and that information is sent back to product sourcing. Quote automation, provides a direct integration between the buyer’s ERP system, Ariba Network, and SAP Ariba Discovery to quickly build and publish tactical Request for Quotation (RFQ) events and retrieve bids from suppliers. The buyer has the option to compare and award these quotes in the solution or export all bids to do awarding in the ERP. An RFQ is directly sent to Ariba Network via SAP Ariba Cloud Integration Gateway, and from there to SAP Ariba Sourcing as a sourcing request. The sourcing request is routed to the appropriate sourcing manager based upon the header data sent from SAP ERP or SAP S/4HANA. The sourcing manager is notified to review the sourcing request and edit and send it for approval if required, and then creates a sourcing project based upon the most appropriate template. Ariba Spot Quote: Sometimes buyers have an unplanned and immediate need for certain items that are not covered by contracts and strategic sourcing. These ad-hoc, one-time purchases are known as tactical spend. Ariba Spot Quote, which builds upon the core functionality provided by Ariba Sourcing, Ariba Discovery, and Ariba Network, is a solution that optimizes such ad-hoc activities and automates the process completely or partially. Ariba Spot Quote also includes supplier enablement features of the Ariba Network to on-board new suppliers and to import their vendor data from the buyer’s ERP system. Spot Quotes are ideal for smaller events, for example an event with 3 to 4 suppliers, allowing a buyer to quickly experience online sourcing without a substantial commitment of time or resources. starts in the SAP system, when a user creates an RFQ (Request for Quotation) from a purchase requisition or from scratch. Users enter event open and close dates, and specify line items with material groups and receiving plants. The RFQs are sent through the Ariba Network Adapter for SAP PI to Ariba Network and from there to Ariba Sourcing, which automatically creates an RFQ event and publishes it on Ariba Discovery. Suppliers can either be invited as part of the Spot Quote event or matched through Ariba Discovery based on product and service categories and location. If an invited supplier is not registered on Ariba Network, an Ariba Network account is automatically created for them. Invited and matched suppliers receive notifications about the Spot Quote event from Ariba and can then respond directly to the RFQ event in Ariba Sourcing. Depending on how Ariba Spot Quote is configured, supplier responses can automatically be sent back to the SAP ERP or S/4 HANA system as purchase orders with no action from project owners, or buyers can manually award suppliers directly in the Ariba Spot Quote solution. When a buyer publishes a contract, SAP Ariba Contracts sends contract information such as the contract header data and line-item data to SAP ERP or SAP S/4HANA. SAP ERP or SAP S/4HANA then creates an outline agreement based on the contract information received from SAP Ariba Contracts. Buyers using SAP Ariba Sourcing or SAP Ariba Contracts can import organizational data, cross-application data such as inco-terms and payment terms, and material master data from SAP ERP systems. This allows buyers to initiate the sourcing process in SAP Ariba Sourcing and send the award to SAP ERP or SAP S/4HANA. Sourcing of service items has been enhanced with the support of service hierarchies. 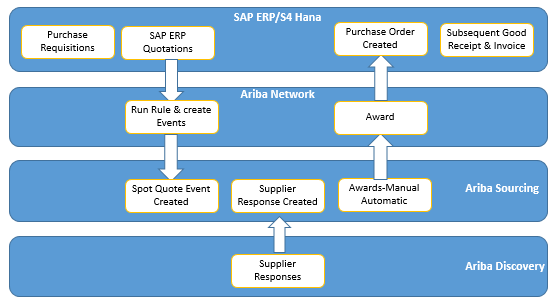 Buyers using SAP Ariba Sourcing and SAP Ariba Contracts can add multiple service items with up to five-level hierarchy (one parent item and four-level child hierarchy) in the integration flow from an RFQ in their SAP back end system (SAP ERP or SAP S/4HANA) to an SAP Ariba sourcing request, SAP Ariba award to PO and outline agreement, and SAP Ariba contract to outline agreement in their SAP back end system. 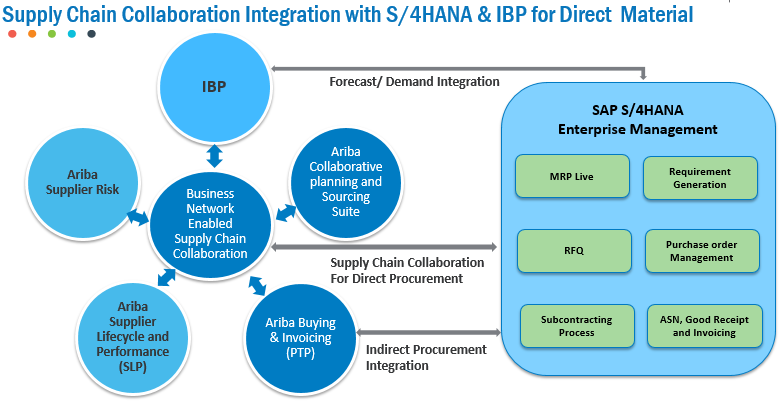 SAP Ariba Cloud integration gateway provides Support for scenarios on Direct procurement integrations with Ariba and Core ERP Solutions S4 HANA/SAP ECC.